Pool, Billiards, Snooker – What’s the Difference? 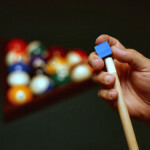 You are here:Home / Uncategorized / Pool, Billiards, Snooker – What’s the Difference? Pool,billiards, and snooker are all “Cue Sports”. They fall under this umbrella, and are games of skill involving a player using a cue stick and hitting billiard balls around a billiards table. Not simply “games”, the genre has been considered a “sport” since at least 1893. Formerly known overall as “billiards”, there are three major types of cue sports commonly played today. · Carom Billiards is a variety of games played on a table which has a length of ten feet; there are no pockets on this table, and few balls are used. 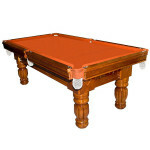 · Pool is played on a six-pocket table varying in length between seven, eight, or nine feet. 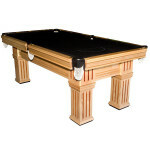 Pool games include eight ball, nine ball, ten ball, straight pool, one pocket, and bank pool. Pool is the game most commonly played recreationally in pubs. · Snooker and English Billiards are cue games played on a large, pocketed billiards table of twelve feet in length by six feet in width. Snooker and English Billiards are considered to be completely separate games from pool and Carom Billiards; historically, they developed separately, and are characterised very differently in terms of terminology and culture of play. 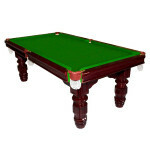 · Snooker uses twenty two balls, including the white striker ball. This is followed by fifteen reds, one yellow, one blue, one pink, one brown, one green, and one black ball. Snooker balls are smaller than pool or billiards balls, and the pockets are smaller as well. 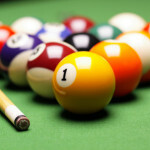 · Pool uses nine balls, which are numbered and striped. 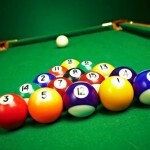 · Billiards uses three balls (white, yellow, and red); the white and yellow balls can acts strikers. With no pockets, the game is somewhat different than pool or snooker, and the table lining is much faster than it is for snooker or pool. The size of the balls varies depending on the specific game being played. Billiards is the oldest of these games; many historically consider billiards to be a “gentleman’s game”, whereas pool more a pursuit for the “common” man.